FB 90-93 with room for more, above-average FB movement, late life. Curveball 73, some shape, was developing power when I saw him. CH at 85, a little too hard. Good extension, balance and downhill for a tall pitcher. Heading into the draft, Baseball America ranked Biddle as the 3rd best prospect in Pennsylvania and the 116th best in the nation. ESPN also posted a report (Insider Only) on Biddle, where it noted that he pitched on a good downhill plane, but noted that he needs to develop his secondary pitches to hit his upside of a #2 starter. 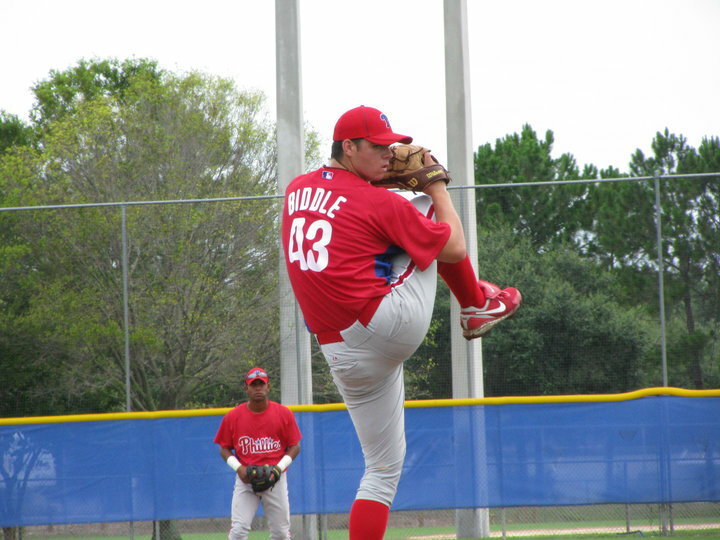 Career Synopsis: Biddle began his season with the GCL Phillies. Generally limited to three or four innings per start as he built up arm strength, Biddle was not overmatched in his first pro experience, pitching 33.1 innings, striking out 41, walking 9, allowing 35 hits and two homers. He was moved up to Williamsport in late-August and made three starts covering 10.1 innings All told across the two stops, Biddle posted very respectable 10.3 K/9 and 2.5 K/BB ratios. In 2011 Biddle pitched the entire year in Lakewood where he pitched a very solid 113 innings. He started rough in April but he improved his ERA in each successive month. The only problem with Biddle’s season was his high walk rate of 4.47 BB/9, but his 2.98 ERA and 124Ks where a success. The Phillies sent Biddle to Clearwater for the entire 2012 season. His 3.22 ERA and league leading 151 strikeouts earned him the #10 ranking in the FSL by Baseball America. Summary: If everything comes together Biddle has 3 plus pitches and a workhorse frame. It is profile that suggests a very good #3 starter, with an outside chance at being better if the command and feel allow the arsenal play together. The problems is that Biddle’s control went from fringy to awful as injuries and illness caused issues with his delivery, arm slot, and stamina. If the control remains horrible Biddle is more of a back end starter that will show flashes of dominance. The most likely outcome is that he becomes solid #3/#4 starter that puts above average results, giving 200+ IP a year. Honestly, when I look at these videos I see Barry Zito in his prime. He has long arms and legs, and uses them to create excellent leverage. He gets good extension to the plate, which helps create deception. I don’t see any red flags in his delivery, he is very free and easy in his delivery and incorporates his core well, taking stress off his arm. The ultimate question is how much velocity he will add when he is fully developed physically. While his development is very encouraging and he’s still completely “on track”, we’re still asking the same questions about Biddle. If he can consistently hit 93-95 MPH, then he might have #1 upside, a slightly watered down version of Kershaw. If he stays in the 90-93 MPH range and gets consistent with his breaking pitches he’s either a #2 or a #3. All in all, it seems likely that he will, at worst, be a solid major league starter, which is nothing to sneeze at. Did Barry Zito sit at 92 in his career at all? He could touch 93 when he signed, but it was a 70 change and curveball that carried him. I believe that Zito used to pitch in the low 90s. When he did, his plus curveball made him a strong #2 (I know he won a Cy Young, but he was never a true ace). Now he’s in the low to mid 80s and is essentially junk ball pitcher – he’s trying to become another Jamie Moyer. Rarely, with some exceptions, does a human being of a pitcher carry their velo from 18-say-25, into their late 20s and early 30s. The anatomy of the arm’s shelf-life erodes. Understand Biddle, from former GHS classmates who maintain contact with him and his father, say he held back from ‘airing’ it out his first few years based on Phillie’s instructors directions. A good read on his velo would be his average from CLW’s second half season. Thanks for the comprehensive review. The task you’ve set for yrself is to maintain the high level and depth of yr report for the following prospects. As they say: Thanks for all you do. Watching his delivery, I see Zito as well. I like the profiles. It would be nice if you left parts of the older reviews, with dates, to see if opinions changed drastically as the prospect advanced. The one thing I don’t care for is the 20-80 scale rankings on the players. 70s and 80s are thrown around too freely, and 40s aren’t given to theses guys. 40 ratings should probably be the most common ratings for most of these guys’ tools. Yeah, that was some of my mistake when I started writing these (though remember that many of the grades are raw tools) and why I am cleaning these up. I will go back and annotate what was written by James and what I have added. You might want to remove the old clips that were filmed at GFS. His motion has evolved a bit, not to mention his body! It’s still weird from me seeing him throwing off the same mound that my son does now (though it’s not, literally, the same mound, since it is removed each fall for soccer and then rebuilt late in the winter). I like these write-ups, thank you! I am a numbers guy and particularly appreciate the numeric quantification of the the raw tools. I do want to understand how they relate to other traditional statistics and in most cases I do, eg arm strength relates to innings per start and innings per season, fastball relates to MPH and movement, etc. I understand the difference between command and control. My question now is how to relate control to BB/9. Can you explain Biddle’s 55 current control assessment given the fact that his 2012 BB/9 of 3.4 was higher than the FSL average of 3.3? Since many pitchers in the league are not even true prospects, at first glance that sounds no better than 45 present control. Is it his age? League average pitcher was 23 and Biddle was 20. Are the current tool assessments adjusted for age? I had thought that are they absolute scores independent of age? Thank-you again for providing this forum and for these great reports! Arm strength is actually raw ability to throw the ball hard, it is something put down by James in his first report so I have continued it. If you are looking for ability to log innings I would look at the durability and mechanics scores (I really can’t give any pitcher under 24 higher than a 60 on these because young pitchers break unexpectedly). When it comes to control it is not just BB/9, I will use that to look at outliers, but the score I gave is purely a call on the reports I have read which all agree he has slightly above average (55) control. The command score comes from reports that he has shown a good ability to locate the fastball and curveball around the zone. When dealing with control and BB/9 you have to remember that control is the ability to throw strikes not that you do throw strikes (strategically of course you don’t always want to throw strikes). The discrepancies can come from how you try to get your outs, are you more likely to go outside the zone to try and get them to miss at something (a mistake many young pitchers make), or do you always go right at them in the zone.